Our Latest Publication Accepted and Now Online! Great news our latest publication “Global phosphoproteomic mapping of early mitotic exit in human cells identifies novel substrate dephosphorylation motifs” has been accepted by the top Proteomics Journal Molecular & Cellular Proteomics. And here is an still image from the paper showing live HeLa cells undergoing forced phosphatase dependent mitotic exit. 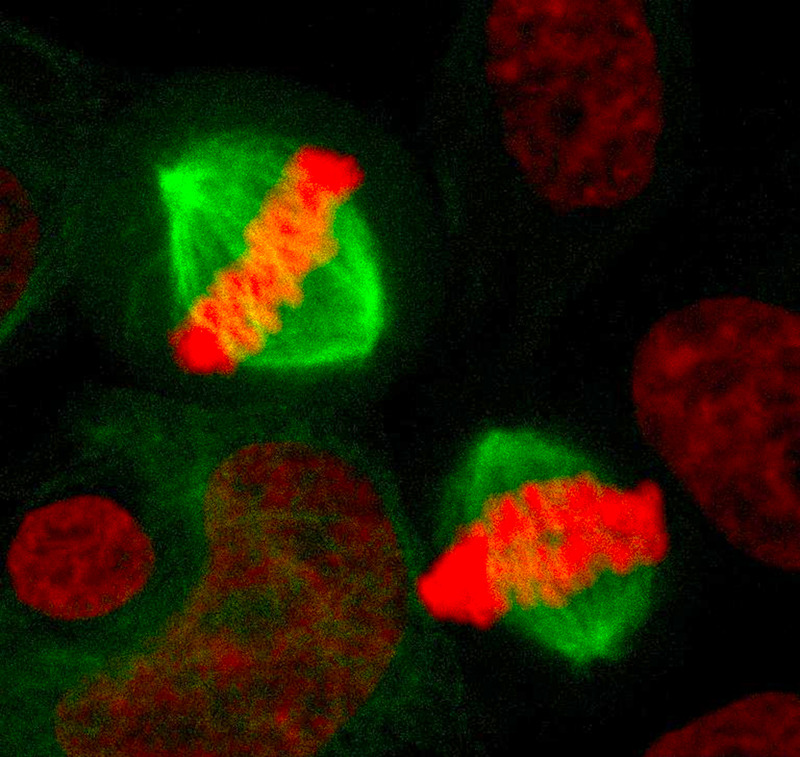 The red colour is Histone H2B tagged with the fluorescent mCherry protein, and the Green is tubulin tagged with GFP (green fluorescent protein). This entry was posted in Info, News and tagged anaphase, Cdk1, cell division, Confocal, Dr Andrew Burgess, Garvan, green fluorescent protein, HeLa cells, kinase, Kinghorn Cancer Center, mCherry, MCP, metaphase, microscopy, Mitosis, mitotic exit, phosphatase, phosphoproteomics, phosphorylation, PP1, PP2A, ProteomeXchange, proteomics, SILAC. Our latest Publication has received a F1000Prime Recommendation !